At this point, you probably already heard about vSphere Integrated Containers and how it solves many of the challenges with traditional containers management at scale. One of its key pillars is the implementation of Container-VMs, meaning that for each container you have a corresponding VM, this approach allows us to use vSphere distributed Port groups or NSX Logical Switches to secure and segregate network communication as has never seen before. Let’s examine what network options are available for VIC. Its main use is to pull container images from registries, like Docker Hub, and enable access to containers services through port mapping. If not another optional network is specified during VCH creation it will also handle communication from VCH to vCenter and ESXi hosts and Docker API calls from clients creating and managing containers. It’s the segment where the containers communicate with each other. If Management network is not specified it will also handle communication between VCH and containers. communication between VCH and containers. When specified, it will be used to expose the Docker API service to clients in order to create and manage containers by the clients. 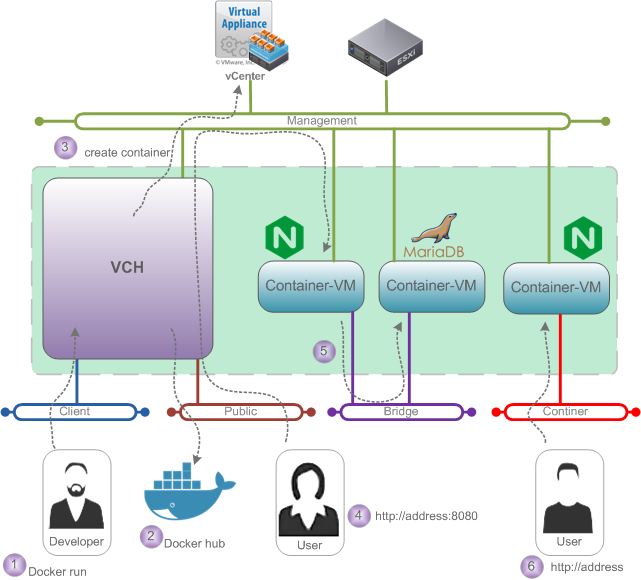 When specified, it will expose containers services directly on the network, bypassing the VCH altogether. That’s a great option which only VIC can provide, avoiding the single point of failure VCH can be, also providing dedicated network bandwidth per container. Let’s see all the communication possible within this solution. 5 – Frontend container app access data from the backend database through the use of Bridge network. If you want to learn more about the networking and advanced examples, please, check VIC documentation here.